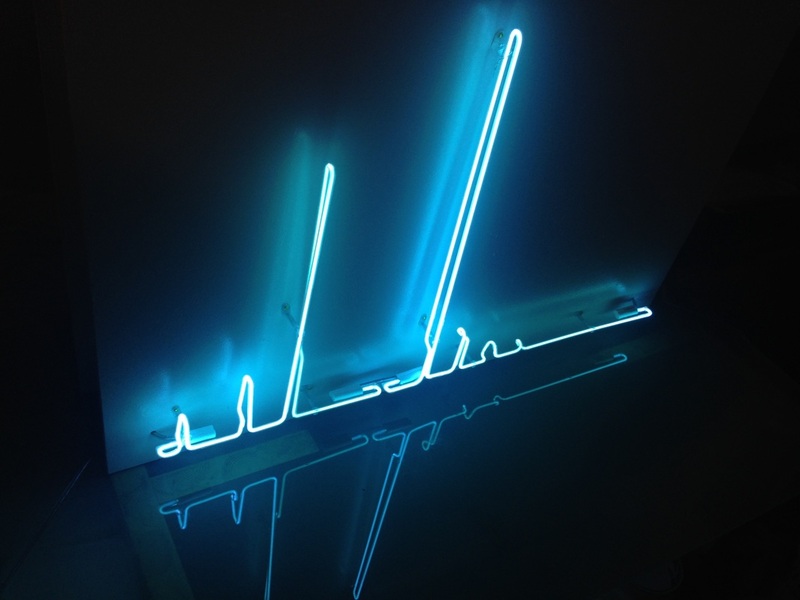 Spectra I is the first in a series of art work in neon light. The design of the work is created using the light emission spectrograph of the light itself. Spectroscopy plays a huge role in everyday science from chemical engineering to cosmology. Almost everything we understand about the universe has been discovered by studying various electromagnetic wavelengths, especially those within the visible range. Previous studies in chemistry, cosmology and of the mechanisms of light production for pyrotechnic chemistry have informed the concept for this series. The position of the peaks correspond to the photon wavelengths being emitted from the light. The height of the peaks represent the number of photos at that wavelength being emitted. The scale chosen shows wavelengths of 350 – 800 nanometers which encompasses range visible to the human eye. What we understand to be 'neon lighting' is not always made from neon. 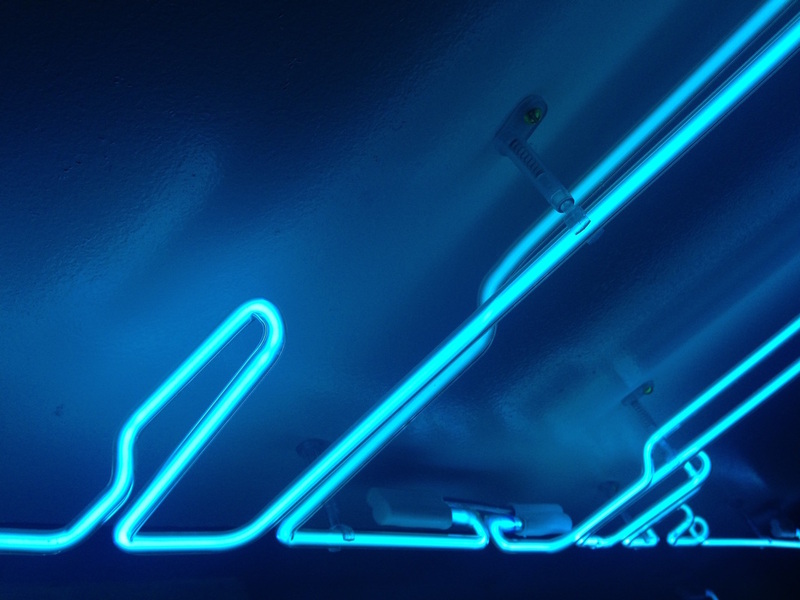 Most 'neon lights' contain either neon or argon gas. Neon lights glow red. 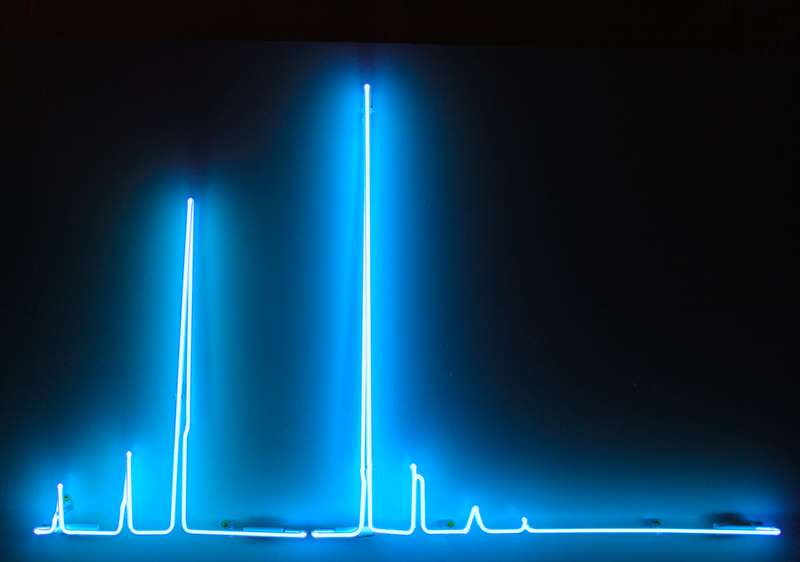 Spectra I is made from argon gas in clear glass which, as you can see, glows blue. 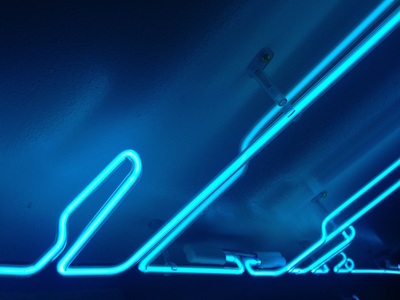 Many of the colours available in the neon light industry are created using phosphor based powders which coat the inside of the glass. Each one will have its own unique spectroscopic 'fingerprint'. Even so its not that simple. All the lights contain Mercury which enhances the efficiency and lifespan of the light. The peaks in Spectra I are almost entirely caused my the mercury content dwarfing the peaks of the Argon itself. Research and data collection for this work has been conducted in collaboration with Jose Videira working in the Quantum Photovoltaic team at Imperial Collage. The collaboration with the Quantum Photovoltaic department will continue as the series expands. Aoife is also working on a spectroscopic animation using the continuous motion property of the specific spectroscopic equipment and program she has been using.